A piping hot bowl of oatmeal is a breakfast staple in many parts of the world. The versatile oat is produced in various permutations for consumption. Two types of oatmeal are rolled, probably the most common in the United States, and steel-cut, also known as Irish oatmeal. Oatmeal obviously starts with oats. 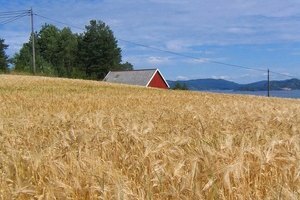 After harvesting, the oats are first cleaned and hulled, which removes the grain's outer shell or hull. This leaves the inner kernel, also known as the groat, which is then heated to dry the kernels. The next stage varies depending on the type of oatmeal being produced. Old fashioned oatmeal is probably the most common type. Picture the ubiquitous Quaker Oats box. To make this type of oatmeal, the groats are rolled and crushed into flat flakes. Irish oatmeal is made differently than regular oatmeal. Instead of the groats being rolled, Irish oatmeal's kernels undergo a steel-cut process. Using giant steel blades, the oats are cut into small pieces that, rather than being flattened, retain their shape, albeit smaller. 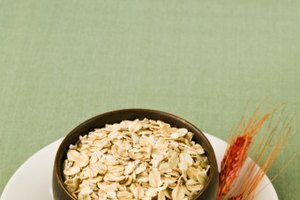 Irish oatmeal (also known as coarse cut and pinhead) is less processed than the rolled variety. 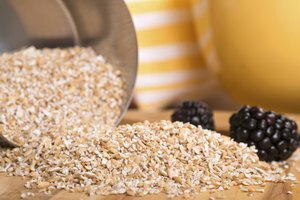 The major differences between regular oatmeal and Irish oatmeal come down to their texture and cooking time. Irish oatmeal, because it is cut, has more texture and is crunchier. It also tends to have a nuttier flavor than rolled oatmeal. 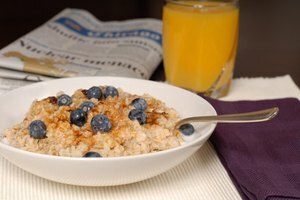 Because of its thicker size, Irish oatmeal takes longer to cook, upwards of 30 minutes in some cases. Rolled oatmeal is softer to chew and cooks in less time than the Irish version. Its shelf-life is longer than steel-cut because of its processing. Rolled oatmeal is also generally less expensive than Irish. Both are comparable in nutritional value, with perhaps a slight edge going to the steel-cut because of its more limited processing. Ancient Greeks are believed to have made the first oatmeal-like dish. An 18-ounce Old Fashioned Quaker Oats package holds about 26,000 rolled oats.